Societies today are in a period of dynamic change, highly fluid and contested in moving from traditional to liberal and from local to global, as well as varying from highly developed to emerging market economies. Alongside and facilitating this is a rapidly and exponentially changing digital media industry, including new technologies, multi-platform distributions and advertising models. 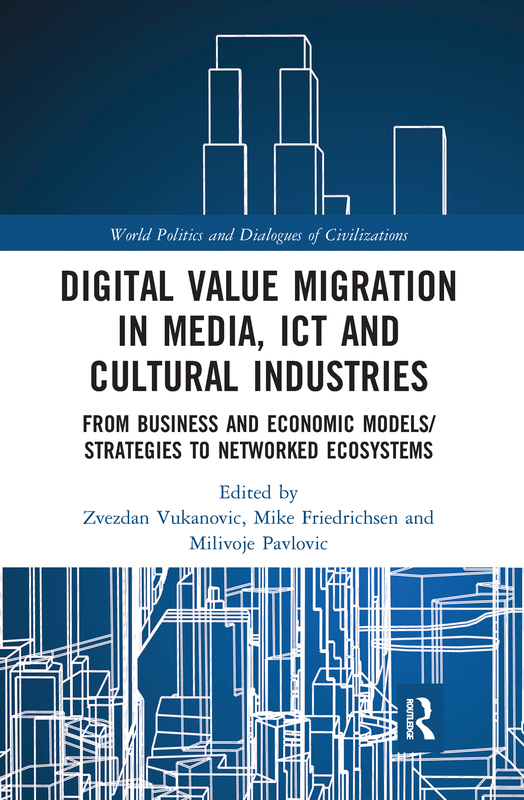 This monograph highlights, identifies, evaluates and provides rich insight into the complex nature and meaning of different digital value migration in media corporations and ICT companies. It illustrates how such values affect both the internal and the external environments of media companies and industries, as well as prosumers' consumption. Including chapters from expert scholars and industry practitioners representing cutting-edge research in the U.S. and Europe in the fields of digital convergence, broadband, media and information communication technology (ICT) business and technology, the book helps academics, researchers, media policymakers and corporate executives better understand today’s undulating media and ICT markets. Specifically, it illuminates where they have come from, what is at stake and what forces drive and constrain them in global hypercompetitive markets. Ultimately, it aims relatedly to facilitate high academic, business and professional standards. This text will be of key interest to scholars, students and business and industry practitioners in digital media, media management, international business, media economics and media policy and, more broadly, to those in the cultural industries, strategic management, business studies and marketing.